TUESDAY, Oct. 18, 2016 (HealthDay News) -- U.S. school lunch guidelines introduced a few years ago are improving students' eating habits, a new study suggests. Researchers analyzed data on the National School Lunch Program, which was enacted in 2012 to provide students with more fruits, vegetables, whole grains and fat-free or low-fat milk. The guidelines were also intended to reduce kids' consumption of salt and saturated fats. After the standards were implemented, there was a 4 percent decline in the total calories of students' lunch choices, and their calories from fat fell 18 percent while calories from salt decreased 8 percent, the researchers said. The researchers did find that students who received free and reduced-price lunches were more likely to choose entrees with higher levels of fat and less likely to select entrees with high salt levels. Students who paid full price for their lunches were less likely to choose entrees high in fat or salt. They were also more likely to choose foods higher in protein, the researchers said. 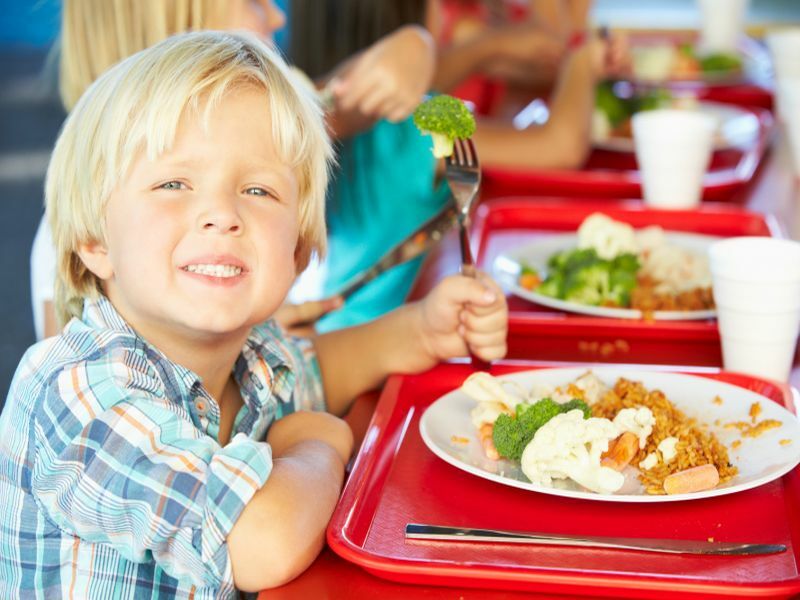 "The students more likely to participate in free and reduced-price lunch programs are among the same populations most likely to suffer from obesity and related health risks," said study lead author Janet Peckham, from the U.S. Food and Drug Administration. "Our goal was to identify any systematic differences in their lunch choices versus those paying the full price, to see how well the school lunch program was meeting its goals of providing food assistance to undernourished children and combating the rising rates of childhood obesity," she added. It turns out that even though students receiving free and reduced-price lunches choose less healthy foods, the calories in those foods have been reduced, said study co-author Tom Mroz, a professor in the School of Policy Studies at Georgia State University. The study was published recently in the American Journal of Agricultural Economics. Almost 32 million U.S. students are served school lunch. In 2014, school cafeterias served up nearly 5 billion lunches. More than two-thirds of these lunches are free- and reduced-price lunches that adhere to the federal school lunch program guidelines.